"Supported by Diabetes UK." At foot of back cover: NHS, North West London. 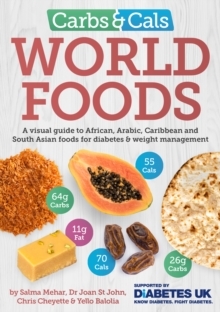 Filled with 750 photos of African, Arabic, Caribbean and South Asian foods, this visual guide is the essential resource for diabetes management, carb awareness, weight loss, portion control and healthy eating. The Carbs & Cals range of books is nationally recognised as the leading resource for diabetes & weight loss, using their revolutionary method of showing hundreds of food photos to make counting carbs and calories a breeze. FEATURES:- 750 photos of food & drinks commonly consumed by African, Arabic, Caribbean and South Asian communities- Carb content clearly displayed using blood glucose icons, highlighting each portion's possible effect on blood glucose level- Values for calories & fat also shown- Up to 3 portions for each food- Pictorial format makes the book accessible for those with limited English language skills- Informative introduction, explaining blood glucose and diabetes, the amount and type of carbs (and other nutrients) to consume, glycaemic index, culturally relevant food swap ideas and a guide to weight loss. CHAPTERS:Includes sections for African, Arabic, Caribbean and South Asian foods (arranged into meals, sides, snacks, breads, desserts and drinks), along with a general section encompassing foods commonly eaten by all the communities.